Get Serious About Getting Fit !!! Hey you!! Yes! YOU!!! Its time to get serious about getting fit! It's time to do away with the excuses about not having enough time to workout. Its time to start eating right. I'm challenging myself and YOU for the month of June to workout daily and eat right!! So who is up for a 30-day challenge?? I already am well aware of what my issue is. I am not consistent in the gym. I will start off good and then start falling off. Another thing I will do is eat everything that I know I shouldn't eat and then wonder why I'm not losing weight. One thing I have been doing is maintaining these 175 lbs. At one point I did go to 180 but I think I panicked and got back to 175. Now I know for some people that doesn't seem like a lot and I know I have been told that I carry my weight well. But for a chick that is not comfortable being over 150... these extra 25 lbs have been a struggle. So I'm ready!! I'm ready to get it off and keep it off. I was talking to a friend last night (who happens to be personal trainer) and I was telling him my plans of losing these 25 lbs by July. He told me that was not possible and I'm so determined to prove him wrong!! Although I know that losing the right way and the healthy way takes time, I still want to lose as much as possible this month and not back track because of bad habits. Here are a few things that I am going to keep in mind during this 30 day journey!! Everyone has triggers/ factors that contribute to weight gain and by knowing what they are and recognizing when they occur is a major factor in determining your success. I know when my friends call and want to go to the Mexican spot, I have to decline. I can not be successful on my journey when I know that if I go I'm going to be eating nachos and drinking margaritas. For some people stress eating is a problem so you have to recognize things that stress you out and act accordingly. You have to be aware of whats going on in your life that works against your goals and find ways to combat it. The Scale Is The Devil!!! DO NOT ...... 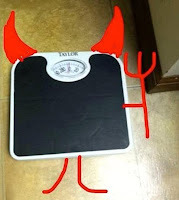 I repeat... DO NOT get on the scale during your journey!! This will only discourage you! Been there and done that!! I was doing so well with eating and working out and after 3 days I got on the scale and had gained a pound! I was so upset and I went and ate a bowl of ice cream. The scale can be very deceiving and its best just to stay away from it for a while. If you want to know if you are doing well, you can really judge by how your clothes fit. Losing weight and getting in shape is 80% what you eat and 20% working out. So basically you can work out all day long, but if you are not eating right, its hard for your body to change. Once you actually reach your goals and you are in pretty good shape then you may can eat what you want sometimes, but for the most part, in order to maintain a healthy weight and body shape- you gotta eat right!!! Its best to make healthy eating habits a lifestyle and then it gets easier and easier thus becoming the norm. That;s the bottom line! Just don;t give up!! You can do it!! I'm going to do it! I have done it before and I will do it again. If you feel like its too much, then get you an accountability partner to help you through. Or team up with a workout partner or even get a trainer!! No matter what you do, DON'T GIVE UP!!!!! !